Layered cloth armour relies on the strength of many thicknesses of cloth sewn together, whether at the edges, with loops of quilting like those which attach the buttons to an old-fashioned sofa, or with lines of quilting. A text from fifteenth-century France recommends thirty layers of linen (an ordinance of Louis XI of France, reprinted by Charles ffoulkes and later copied onto the Internet), and an armour presented to George IV in the royal collection at Windsor was stuffed with at least 35 old garments. These heavy armours are about 3 cm thick, similar to the thickness of the heaviest stuffed armours measured in museums or described in contemporary sources. Robert Elgood cites sources for armours and shields of 40 or 50 layers in India. As these citation suggest, its easiest for English-speakers to learn about layered cloth armour through texts from 15th and 16th century Europe and surviving examples from 18th century South Asia. However, it was once widespread, and I know of evidence from most parts of the Old World to the south and west of the Eurasian steppe. Layered cloth is one of the few plausible guesses for the smooth, light-coloured armour with shoulder flaps which is famous from its paintings on Etruscan tombs and Greek vases, and for the various lineoi thorakes mentioned by Greek writers whose form is not always easy to identify (the fragment of Alcaeus about “the high hall hung with bronze”, Hdt. 7.63, and Aeneas Tacticus 29.4 being the most famous, but that book from the Midwest has a complete list). 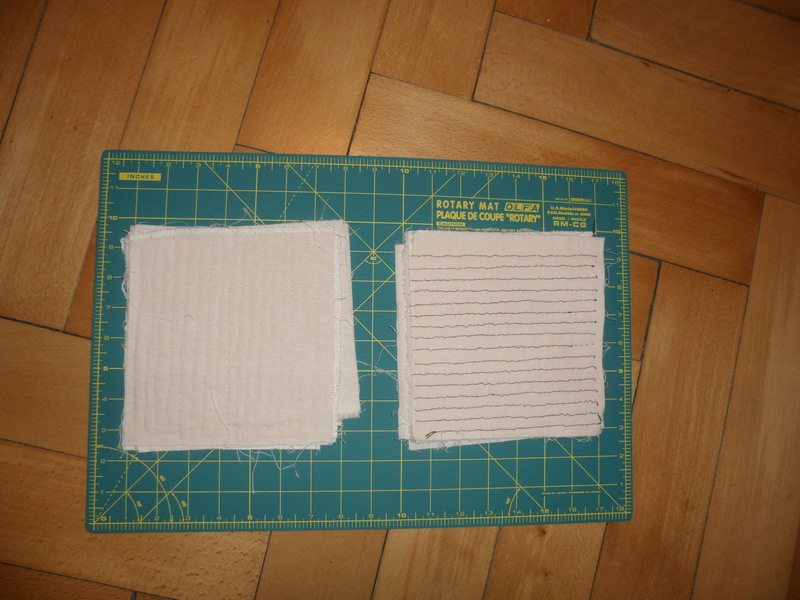 I took sixteen roughly cut squares 7 inches wide from some off-white linen which I had to hand. It weighs 195 g/m2. Because I am just playing around, I did not worry about cutting parallel to the threads or finishing the edges to prevent the linen from unravelling. Following a suggestion from Dan Howard, I rotated every second layer 90 degrees so that the strong warp threads would run in different directions. I do not know of any evidence whether this technique was used for layered cloth armour before the 1990s. Tailors in the western Mediterranean during the sixth, fifth, and fourth centuries would have been most likely to use linen thread, although wool, hemp, and probably silk and cotton were available. Because I am just playing around, I used what I have to hand and tried both heavy and light threads. I quilted one set of patches with Sulky 12 Wt. Cotton Petites made from 100% long-staple cotton, white in colour. I quilted the other with fine organic thread from a source which I do not have to hand; it has “Bavaria 1000/3” and “KF. 7467” on the cardboard spindle. I think that it is “silk yarn” from Naturtuche. I had no trouble with either breaking or getting stuck. I quilted the first patch of eight layers with rows of stab stitches 1 cm apart using the cotton thread. I quilted the second patch of seven layers with a double stab stitch, turning around at the end so that the gaps between the stitches on one side were filled with thread on the other. Some people expect cloth armour to look puffy like a modern coat stuffed with synthetic padding. They are most likely thinking of images from the Maciejowski Bible, or modern artists’ interpretations of similar armour. These armours seem to have been stuffed with raw fibre, such as cotton, tow, or waste silk (or sometimes with rolled-up scraps of cloth, according to contemporary texts), and were quilted to keep this loose stuffing from shifting around and to create an attractive effect. They are different from armours which relied on many layers of fabric for defence. I wondered how much the quilting would compress the fabric and whether the quilting thread would be visible. Visible seams would not necessarily be a problem. Surviving layered cloth armour is usually covered with the most luxurious fabric which the wearer could afford, since this layer was the most visible and was not essential for protection, and was often lined with another specially chosen cloth. If the cover is applied after the main part of the armour has been quilted, it hides the quilting seams and any slight compression of the body of the garment by the quilting. This can be seen on surviving armours from India and in one surviving stuffed armour from France (Edit 2016-02-08: I have now learned that the outermost modules of the pourpoint of Charles VI are quilted completely with silk thread, rather than the thread which holds down the stuffing being different from the thread which holds down the decorative silk cover, but you should go read Tasha’s article anyways). 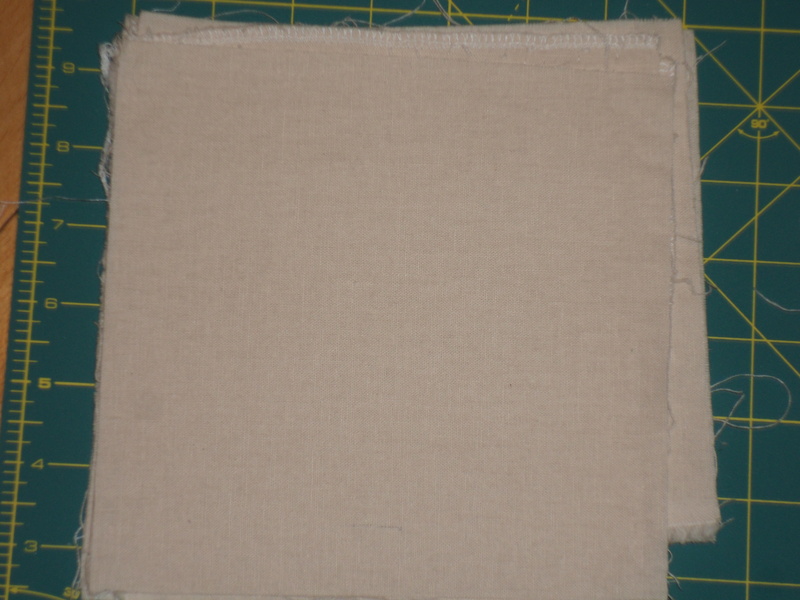 Because I am more interested in cheapness than accuracy, I just used one layer of the same linen as the rest of the patch. 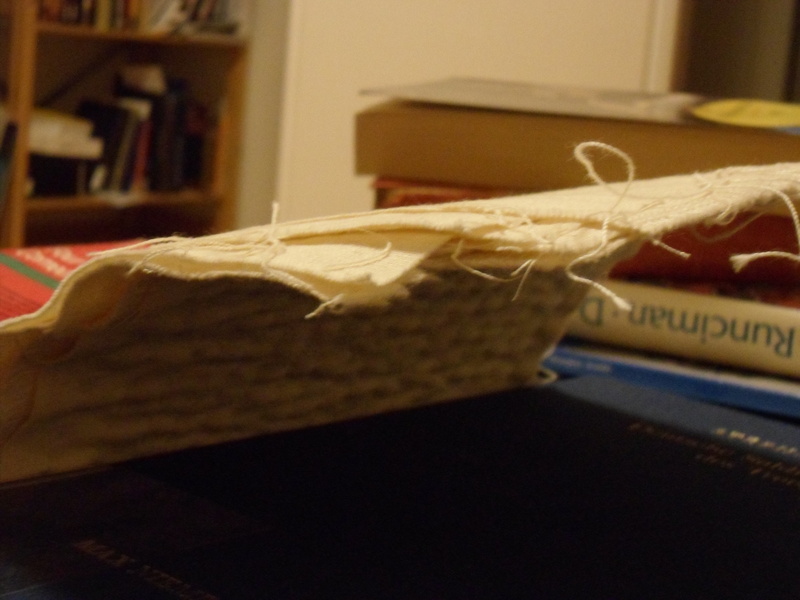 The seven-layer patch with another layer resting on top. Because the silk thread is dyed burgundy, it is faintly visible through the cover. Yet the troughs in the cloth from the quilting are not visible. 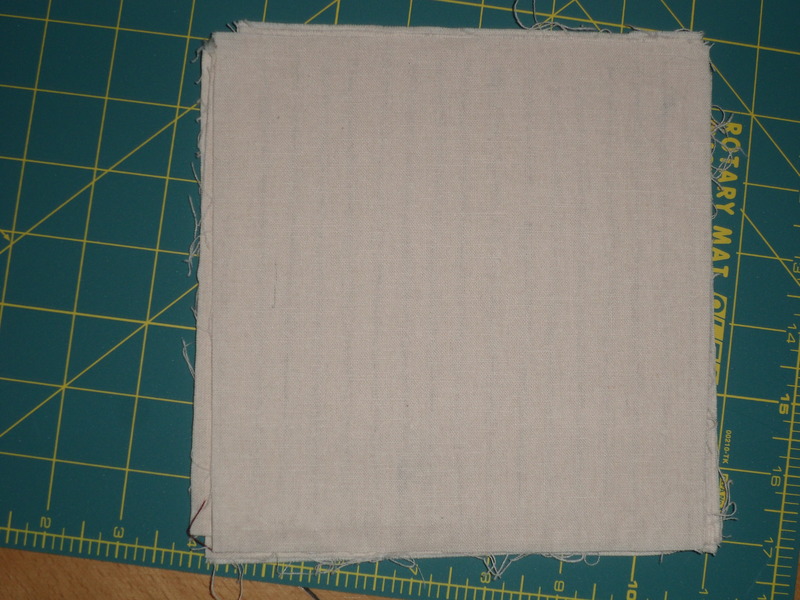 The eight-layer patch with another layer laid on top. The white cotton thread underneath vanishes, and so do the troughs in the quilted layers parallel to the stitching. Based on this, if I quilted the armour with linen thread in the same colour as the inner layers, and stitched the cover gently in place to keep it stretched, I do not think I would have any trouble hiding the lines of quilting. Some people have trouble imagining how to sew through so many layers. I did not have any difficulty sewing through eight layers of linen with a steel embroidery needle. If I did, or if I were reduced to softer bronze or iron or bone needles, I would use an awl with a round cross-section to create a hole, or a sailor’s palm to help drive the needle. Alternatively, several groups of layers could be quilted together and stitched together loosely at the edges. Many of these armours seem to have a band wrapped around the outside edges, and this could hide and protect such stitching. A complete armour of 12, 16, 24, or even 30 layers could be quilted all the way through, or in several groups of fewer layers held between a cover and a lining, perhaps with a few stitches all the way through to hold them in place. Experimentation might reveal the advantages and disadvantages of each approach. I wondered how stiff the result would be to the touch. Some people say that stuffed armour can be as firm as a board. I would not compare these test pieces to a board, but they are certainly firm. Some people ask how layered cloth could be as springy as the shoulder-pieces of the armour of Patroclus. (That armour has more scales and other applied parts than the ones which many people try to imitate, and I am not sure how many other vases show the shoulder pieces leaping into the air when they are untied, but there are at least one or two, such as Staatliche Antikensammlung, München No. 2308). That is a good question, so I decided to try to find an answer. Of course an argument from incredulity is never valid (people skilled in an art can do all sorts of things which someone unskilled cannot imagine how to do), but someone who claims that layered cloth can be so springy should provide evidence to support that claim. The same patch released of its poetic burden. Rather than fall flat, the patch bends into an arc. Photo by Sean Manning, January 2016. I understand that its traditional on these occasions to show that nothing is holding up that which seems to fload in mid-air. I am afraid that I don’t have a scantily-clad assistant to wave somethig underneath the patch, so this will have to do. Photo by Sean Manning, January 2016. 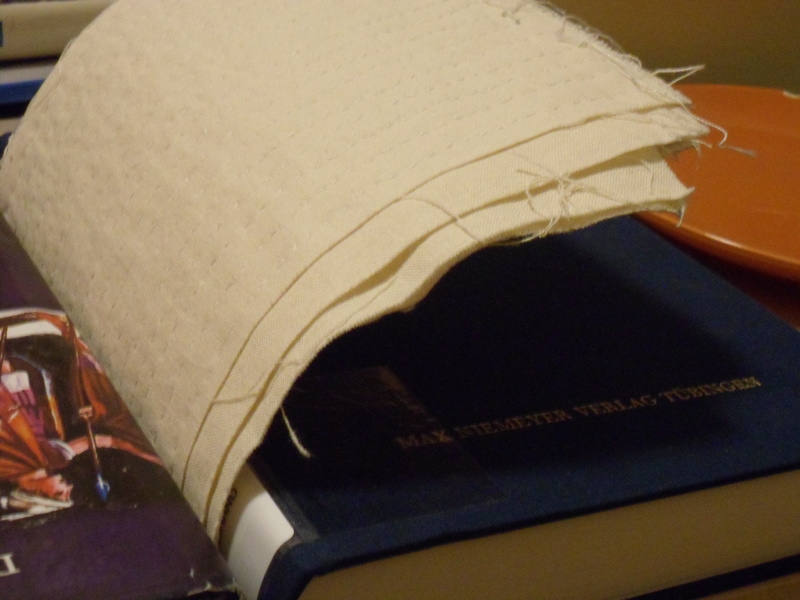 This is certainly not an experiment, just playing around with some books and cloth and thread. Even someone as ignorant about historical textiles as me can see many ways in which these patches are probably different from ancient ones. It would also be possible to interpret ancient linen breastplates as stuffed armour, and to draw on models such as the modern kendo gauntlets (kote) which have many loops of stitching which pass through layers of raw cotton and wool felt (here are some closeup photos of a kendo kote from the middle of the 20th century). I can’t find that style of quilting before the 20th century, I have a vague idea that the history of kendo equipment is controversial, and I lack the skills to research techniques used to make sports equipment in very recent times. So I leave this to other people to play with. Creating a serious interpretation of a whole armour from the ancient world takes endless time and money researching obscure sources and acquiring skills and rare materials. Not many people have all that available. But I hope that this post shows that almost anyone can make something which will help answer some of their questions about preindustrial technologies, as long as they are willing to do a little research and do a little work. Further Reading: Robert Elgood, Hindu Arms and Ritual: Arms and Armour from India 1400-1865 Eburon Academic Publishers: Delft, ND, 2004. A description of layered cloth armours in South Asia in 1817 or 1818 is here. 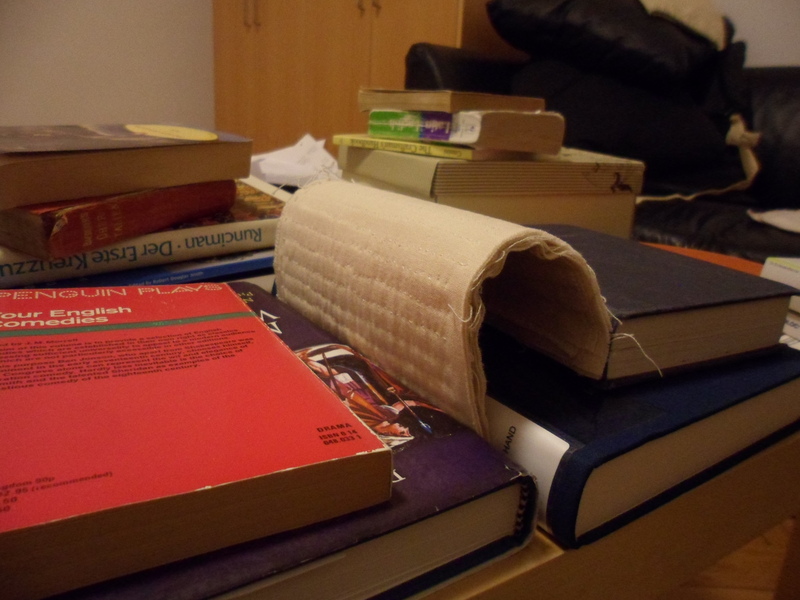 An earlier post in this series has a fuller bibliography. Dan Howard of Maitland, NSW, Australia introduced the community interested in ancient armour to the basic authorities on the world history of armour, including Charles ffoulkes and H. Russel Robinson, and has insisted for many years that Greek linen armour was most likely quilted. Edit 2016-04-19: s/copper/cotton in the second sentence and fixed some other typos. Added link to Naturtuche. Thanks for the comment. There would definitely be lots of different things to experiment with … especially if weavers were involved. I have not been able to obtain an article talking about what seems to be a Roman shin pad or a lining for shin armour which was woven in one very thick layer around 3 mm or 1/8″ thick. I think that it would be nice to bring “ancient textile people” and “armour people” together to talk about solutions. I hope all is well in Victoria. Hi Sean, in your reference to my article on the red coat armour at Chartres, you stated that the fine outer fabric was applied after the other layering/padding of cloth, and that it hides quilting lines. The red coat armour was constructed such that the outer fabric was quilted together with the inner linen and padding layer of the top or outer assembly. An identical assembly of linen and padding (minus the fine outer fabric) was made for the inside of the garment. Thank you for the linked reference. Hope you are well. On p. 167 I describe the two torso assemblies — one that was encased in linen (the lining assembly) and one that is encased in linen and silk (the outer assembly). It is this outer assembly that has silk thread for the quilting. The inner assembly has the linen thread used for quilting. I don’t have any reference to applying the silk at a later point. It was applied at the same time as the whole outer assembly was quilted. Hope this clears it up.